In 12-inch nonstick skillet, heat oil over medium-high heat. Add onions and bell pepper; cook 5 to 7 minutes, stirring frequently, until tender. Stir in tomatoes, harissa sauce, garlic, paprika, salt and pepper. Reduce heat; simmer 5 to 7 minutes, stirring occasionally, until sauce thickens. Gently crack eggs into skillet over tomato mixture. Cover; simmer over low heat 10 to 12 minutes or until egg yolks are firm, not runny. Sprinkle with cheese and cilantro; serve with pita bread, if desired. Can’t take the heat? Reduce harissa sauce to 1 tablespoon, or serve on the side. 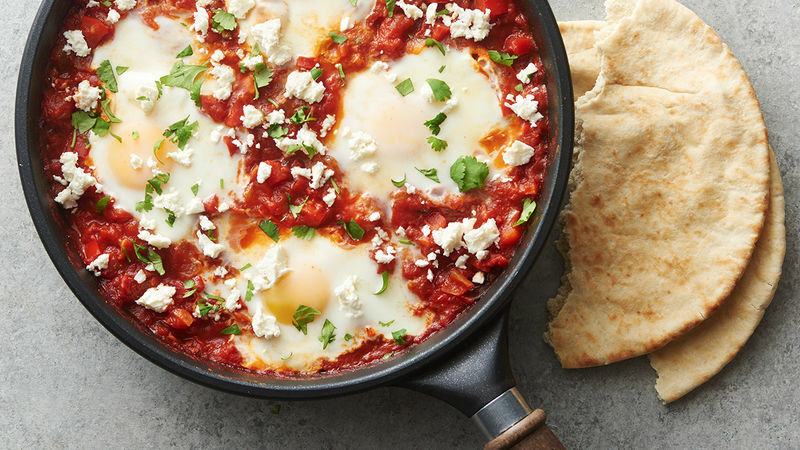 For a fun mashup called “humshuka,” spoon hummus into a shallow bowl, and top with the shakshuka.